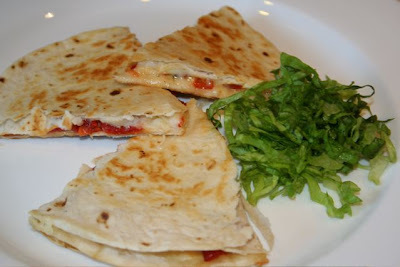 So simple to make and they don’t have to be your typical cheddar cheese Mexican quesadillas. The sky is the limit on the permutations you can make on this basic flat bread cheese sandwich. This one is made with gruyere cheese and roasted red peppers. That’s it! That and some flour tortillas. I like to use a bit of butter and a heavy cast iron pan to make my quesadillas. They come out delicious and crispy. The combination of a flavorful cheese with the roasted peppers was wonderful. Bap (or bop) in Korean means rice. 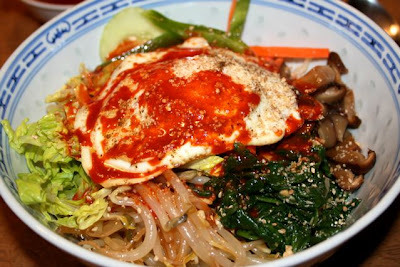 Bi bim means to ‘mix up’. 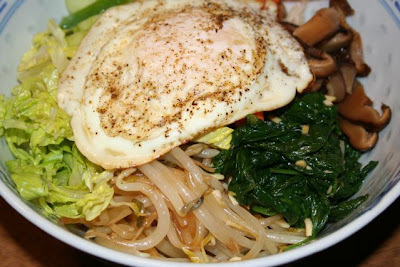 Bi bim bap means to mix up stuff with rice. 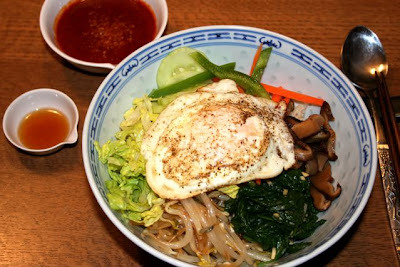 Traditionally in Korea this usually includes bulgogi style beef, various vegetables including bean sprouts, spinach, carrots, mushrooms, cucumbers among others, and always with a fried egg on top. This is mixed up with a spicy sauce and flavored with sesame oil and sesame seeds. Some of the vegetables are raw and some are cooked and marinated with sesame oil, garlic and soy. It is also traditionally served in a heated stone bowl. My take on it this time is hardly traditional on may fronts. 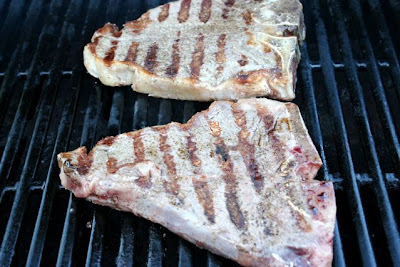 I probably have vegetables that are not used commonly, I don’t have a special stone bowl to put on the fire, and after last evening’s t-bones I left out the beef. The flavor, however, is still quite good. I began preparing this dish early in the day. I steamed some mung bean sprouts just until tender. I did the same with baby spinach leaves; steamed just until they were wilted. These were marinated with a mixture of chopped garlic, soy sauce and sesame oil. I didn’t measure anything, so bear with me. I just splashed some together. I also hydrated some dried shitake mushrooms by boiling in a bit of water for about an hour. These were cooled and sliced. Other vegetables included raw carrots, raw green peppers and sliced romaine lettuce. These were all assembled on top of a bed of sticky Thai brown rice. An egg fried in sesame oil was placed on top. Before mixing this all up I added some sesame oil, sesame seeds and a spicy sauce. The sauce was made with gochujang paste (about 2 tbsp), rice vinegar (about 1/4 cup), soy sauce (about 1/4 cup), water (about 2 tbsp) and sesame oil (about 2 tbsp). 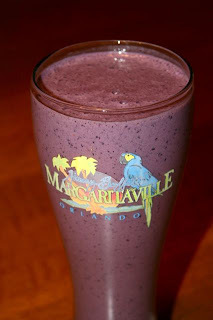 Just mix everything together well and enjoy. To me there is nothing more satisfying than a big slab of medium rare grass fed cow seared on a grill. We’re not talking steak sauce here. Never ruin a good piece of meat with too much seasoning. We buy our beef a half cow at a time from a local farmer. Let me tell you, I’ve had Kobe beef before but North Dakota beef wins in taste and texture hands down. All this tender juicy piece of cow flesh needs is just some salt and pepper. 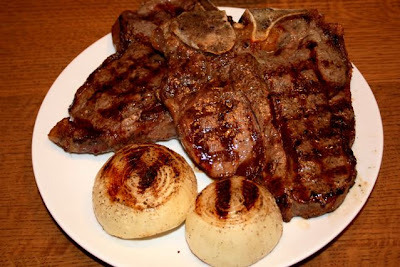 Beef shouldn’t be adorned with complicated side dishes either. 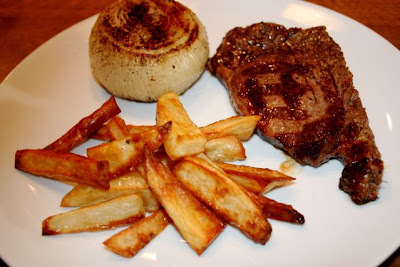 Just a grilled vidalia onion and some home baked fries make a perfect accompaniment to what is flesh perfection. What more is there to say? I likes my beef now and then. My pasta love affair is not over yet. With the same dough I made for the orrechiette, I rolled out another favorite pasta shape of mine, pappardelle. This is like a big wide fettucine noodle. I rolled them out into sheets using my pasta roller and then cut them into wide strips by hand. Another mushroom based sauce was perfect for this. 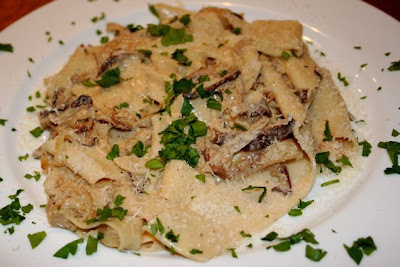 I sautéed garlic, onion and mushrooms in olive oil, added bit of non-fat half and half for richness and tossed in some fresh grated parmigiano reggiano. This was garnished with a bit of fresh parsley. Another satisfying pasta meal.